A pair of red-headed woodpeckers I know, who made their home in an old tree next to the station yard at Atlanta, where locomotives clanged, puffed, whistled and shrieked all day long, evidently enjoyed the noise, for the male liked nothing better than to add to it by tapping on one of the glass non-conductors around which a telegraph wire ran. When first I saw the handsome, tri-coloured fellow he was almost enveloped in a cloud of smoke escaping from a puffing locomotive on the track next the telegraph pole, yet he tapped away unconcerned and as merrily as you would play a two-step on the piano. 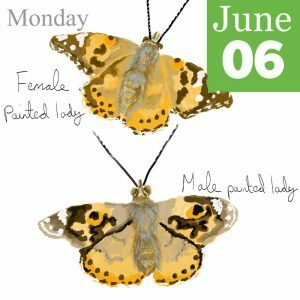 When the vapour blew away, his glossy bluish black and white feathers, laid on in big patches, were almost as conspicuous as his red head, throat and upper breast. His mate is red-headed, too. All the woodpeckers have musical tastes. A flicker comes to my verandah to tap a galvanised rain gutter, for no other reason than the excellent one that he enjoys the sound. Tin roofs everywhere are popular tapping places. Certain dry, dead, seasoned limbs of hardwood trees resound better than others and a woodpecker in love is sure to find out the best one in the spring when he beats a rolling tattoo in the hope of charming his best beloved. He has no need to sing, which is why he doesn’t. Fence posts are the red-head’s favourite resting places. From these he will make sudden sallies in mid-air, like a fly-catcher, after a passing insect; then return to his post. You remember that the blue jay has the thrifty habit of storing nuts for the proverbial rainy day, and that the shrike hangs up his meat to cure on a thorn tree like a butcher. Red-headed woodpeckers, who are especially fond of beechnuts, acorns and grasshoppers, hide them away, squirrel fashion, in tree cavities, in fence holes, crevices in old barns, between shingles on the roof, behind bulging boards, in the ends of railroad ties, in all sorts of queer places, to feast upon them in winter when the land is lean. 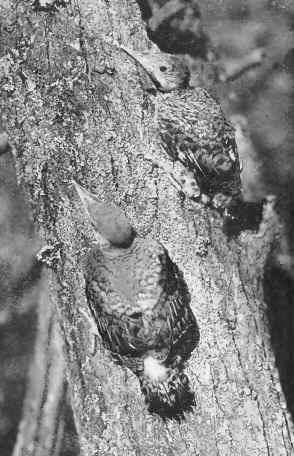 Who knows whether other woodpeckers have hoarding places? 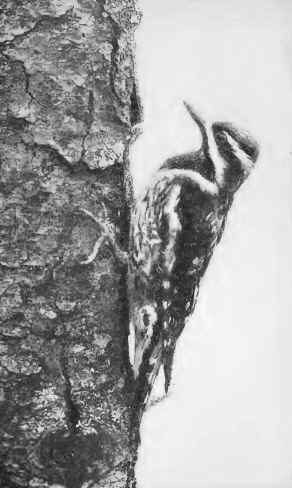 The sapsucker, the hairy and the downy woodpeckers also like beechnuts; the flicker prefers acorns; but do they store them for winter use? The red-head’s thrifty habit was only recently discovered: has it been only recently acquired? Baby flickers just out of their hole. It must be simpler to store the summer’s surplus than to travel to a land of plenty when winter comes. Heretofore this red-headed cousin has been reckoned a migratory member of the home-loving woodpecker clan, but only where he could not find plenty of beechnuts to keep him through the winter.